The casserole is king in the Midwest, down into Oklahoma – and is a cornerstone of the Thanksgiving meal. The Green Bean Casserole – which originated in 1955 in the Campbell Soup Company kitchen – has now claimed iconic status. 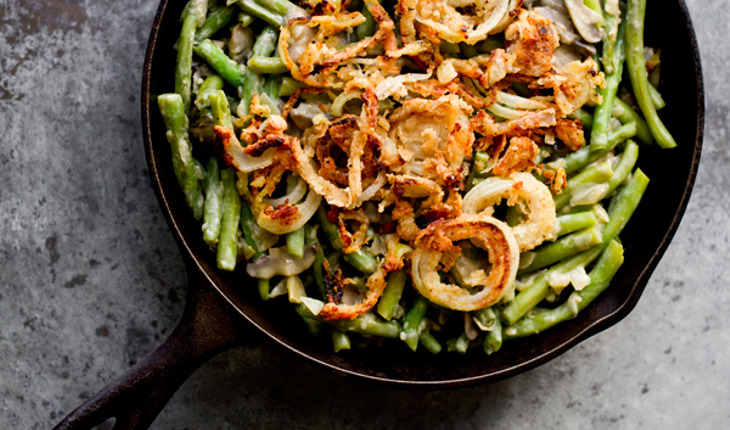 The mix of frozen or canned green beans, mushroom soup or canned cream, French Fried Onions, and a cornflake or Ritz cracker topping is now such a staple, especially in Oklahoma, that a survey of Oklahomans, when asked about their Thanksgiving customs – universally stated that ‘Green Bean Casserole’ was an indispensable part of their meal. In a bowl, combine soup, milk, soy sauce, and pepper. Gently stir in the green beans. Spoon half of the mixture into a 13×9-in. baking dish. Sprinkle with half of the onions. Spoon remaining bean mixture over the top. Bake at 350° for 30 minutes or until heated through. Sprinkle with remaining onions. Bake 5 minutes longer or until the onions are brown and crispy. We love to use classic Campbell's soup for this recipe.